Despite minor flaws, the Totobay Wake-Up Light (2nd Generation) is one of the best light therapy alarms you can get for such a low price. 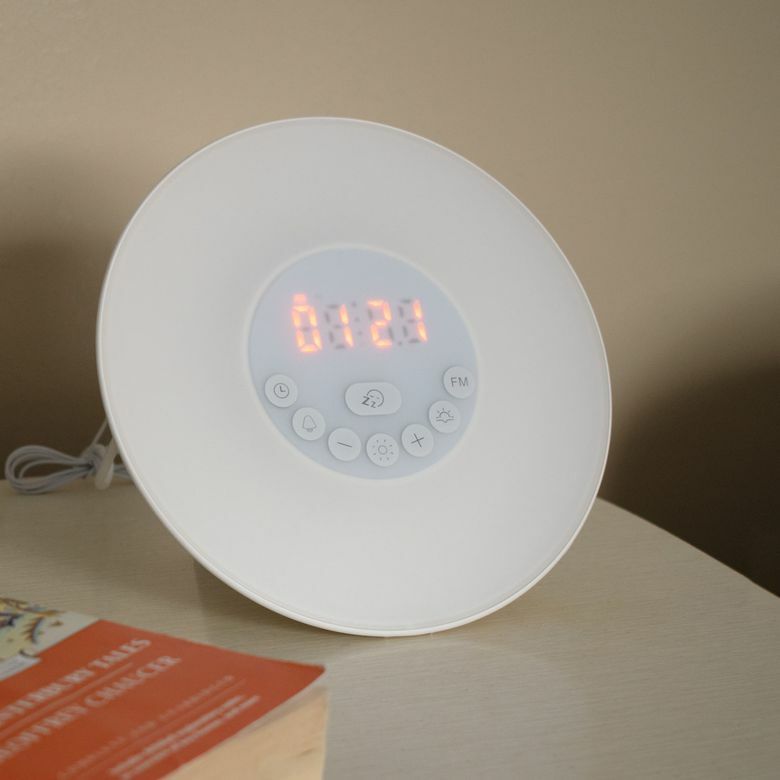 Light therapy alarm clocks are designed to gently wake the user up via light rather than a blaring beep. It’s an intriguing idea, but it can seriously lighten your wallet since many of the higher quality ones can cost upwards of a hundred dollars. The second generation Totobay Wake-Up Light bridges the gap between price and consumer wants to create a solid, budget-friendly alarm clock. At 6.5 inches in diameter and 3.9 inches in width, the Totobay LED Wake-Up Light (2nd Generation) is compact enough to fit on an end table or a nightstand. It is also very light, weighing only 10.4 ounces. The interface and buttons are in the center, while the LED bulb circles around it, like a donut. The back of the clock has more buttons, along with the speakers, and a kickstand to hold it steady on your bedside table. Setting up the Totobay is very basic and can be done in under two minutes. The clock comes in three parts: the clock interface, the charging cord, and the USB plug-in, which easily inserts itself into a port in the back of the clock and then plugs into any wall outlet. We simply put the pieces together, plugged it into the wall, and it was ready — instant and easy! Another perk to note is that in the event of a power outage, there is a battery compartment in the back, so you can insert two AAA batteries, or a USB port enabled charger, and sleep comfortably knowing that you will still get up on time no matter what. Another perk to note is that in the event of a power outage, there is a battery compartment in the back. The clock’s basics are easy to navigate. It comes with a number of simple buttons, including: one to set the time; one to set the alarm; one to set the time of sunrise/sunset; and one to start up the FM radio. Configuring the clock was easy. The moment the clock starts up, the first thing that flashes across the interface is setting the time. Setting the alarm is equally simple, just press and hold the alarm button (in the shape of a bell) to set it. Tapping the same button switches the alarm on and off. One minor issue we noticed was the clock numbers. Lit in an orange hue against a light gray backdrop, the numbers were difficult to read. Thankfully, the back of the clock also sports brightness settings for these numbers, so with the tap of this particular button, we were able to read the interface more clearly than before. If you press the button once more, the time disappears entirely, preventing the light from disturbing your night’s sleep. Using the Totobay in the morning was a bit of a mixed bag. As the alarm time grew near, the light popped on and brightened from 10% to 100%, waking us up a few minutes before the audio alarm sounded. This is exactly what it’s supposed to do — wake up the consumer gently. With the exception of the time numbers, the buttons don’t emit any light and get masked by the light. The alarm’s audio left a little to be desired. Despite its seven different sounds, ranging from birdsong to Pachelbel’s “Canon in D” to the FM radio, the audio quality isn’t as strong as it could be. When we were trying to turn off the alarm, we couldn’t see what to press initially. The snooze button is the largest button and easiest to find on the interface in the dark. It’s centered just below the time, which makes it very easy to relax for another five minutes before the audio sounds again — or to buy us time to find the button that turns off the alarm. Another minor issue to note: you can’t control when the light starts to brighten — 30 minutes before alarm time — but you can control the level of brightness. The alarm’s audio left a little to be desired. Despite its seven different sounds, ranging from birdsong to Pachelbel’s “Canon in D” to the FM radio, the audio quality isn’t as strong as it could be, sounding like a 1980s car radio. The alarm sounds fine, scaling up volume effectively. Just keep in mind that you’re getting what you pay for with the audio. If you’d prefer to use the clock as a nightlight in the bedroom as well, the front interface has a light button, which can be used to create a nightlight in two different colors — a plain yellow hue and a rotating, rainbow one. This also has ten different levels of brightness. These lights are also easy to set, as we simply tapped a button on the front, and it rotated between the two shades. Tap again to turn it off. At $25.99 (Amazon), the price is hard to beat for the cost, especially in comparison with the more premium light therapy clocks on the market. The Totobay is a very basic, easy-to-use device. If you don’t want the bells and whistles, this is the perfect clock to get the job done once you adjust it to your preferred settings. However, if you want better audio quality and if you’d like to be able to find buttons in the morning, you might want to spend a bit more for a clock with easier navigation. We primarily tested the Totobay against the Philips HF3505 clock. While the Philips comes with higher alarm audio quality, the Totobay features a more reasonable price tag — $25.99 compared to Philips’ $89.99. Totobay also has more light options, the Philips HF3505 bulb only features one yellow light, while the Totobay has a rotating rainbow-hued option. While it can’t be used for an alarm, it’s a fun amenity that could be used for kids as a nightlight. On top of this, the Totobay has more audio alarm options with seven songs compared with the two audio clips you get with Philips. Want to take a peek at some other options? Head over to read our article of the best wake-up light therapy alarm clocks to buy today. A good way to wake up for the price. While sporting some flaws, Totobay’s LED Wake Up Light (2nd Generation) is a very solid light therapy alarm clock that performs its functions well. There are other, fancier models out there, but the budget-conscious consumer can rest well at night knowing this clock offers reliable performance without breaking the bank. Product Dimensions 6.5 x 3.9 x 6.5 in.